It is important to ask questions before starting any kind of martial arts or fitness program. Here, you can read our answers to some of the questions that we are frequently asked about our martial arts schools in Chester County. Children's Martial Arts, Adult's Martial Arts, Tae Kwon Do, Muay Thai, Brazilian Jiu Jitsu, Russian Kettlebells, summer camps, yoga, and kickboxing. What do I want to get out of the Adult Martial Arts program? Sometimes the most important questions are those we ask of ourselves. By determining your personal goals and expressing them to us, you have the opportunity to be sure that our program is the right fit for you. So take a moment to discern your personal goal. Whether your goals pertain to your fitness, health, or mental and emotional well-being, you can use that introspection to your advantage to make sure you get everything you hoped for from our classes and more. The system taught in our classes is a philosophy of mental discipline and self-control with the intent of influencing a student’s behavior, encouraging participation in the community, and promoting the betterment of society. So, chances are, we can find a way to help you reach your goals. What benefits can I expect from consistent and dedicated martial arts training? Physically, you will be healthier and stronger than ever, plus you will learn valuable and practical self-defense. A strong body builds a strong mind. Mentally, you will build inner strength and become a more powerful and confident individual. A positive mental attitude provides the best ideas for self-improvement. Hapkido prides itself on effective self-defense and as such, employs joint locks, pressure points, throws, kicks, and other strikes. Hapkido is an authentic Asian martial art of total self-defense; it deals with countering the techniques of other martial arts as well as common “unskilled” attacks. Although Hapkido contains both long-range fighting and infighting techniques, the purpose of most situations is to get near for a close strike, lock, or throw. Hapkido emphasizes circular motion, non-resisting movements, and control of the opponent. Practitioners seek to gain advantage through footwork and body positioning to employ leverage, avoiding the use of strength against strength. Taekwondo (also spelled Tae kwon do or Taekwon-do) is a martial art originating in Korea. An amalgamation of Chinese, Japanese, and traditional Korean fighting styles, Taekwondo has become the world’s most commonly practiced martial art and is the national sport of Korea, as well as an Olympic sporting event. In Korean, derived from Hanja, tae means “to strike or smash with the foot;” kwon means “to strike or smash with the hand;” and do means “art of” or “way of.” Hence, Taekwondo is loosely translated as “the art of hand and foot” or “the way of the foot and the fist.” Taekwondo’s popularity has resulted in the divergent evolution of the art. As with many other martial arts, Taekwondo is a combination of combat technique, self-defense, sport, exercise, entertainment, and philosophy. Although there are great doctrinal and technical differences among private Taekwondo organizations, the art in general emphasizes kicks thrown from a mobile stance, using the leg’s greater reach and power to disable the opponent from a distance. In sparring, kicks such as turning (roundhouse), 45-degree, front, axe and side are most often used. Advanced kicks include jump, spin, skip, and drop kicks, often in combination. Taekwondo training also includes a comprehensive system of hand strikes and blocks, but generally does not emphasize grappling. What should I bring to and wear in class? When you come in for your orientation, make sure to wear workout clothes that allow you to easily move around. For future classes, come in your Dragon Gym uniform and bring your belt! Shoes are not permitted on the gray mats, but may be worn on the black mats, which is our dedicated strength training floor. Should you have any specific questions about what to wear or bring to your particular martial arts class, just ask any instructor or fellow student. When are classes and how do I get more info? We offer our Adult Martial Arts classes six days week and several times a day. However, we start all new students with a free, no-obligation orientation lesson with one of our certified instructors. This gives you a chance to see what our program is all about, and our staff the chance to recommend the best program for you. Just give us a call at 610-363-7575 and we’ll be more than happy to help you get started. Do I need to be in really great shape to start martial arts? Not at all. 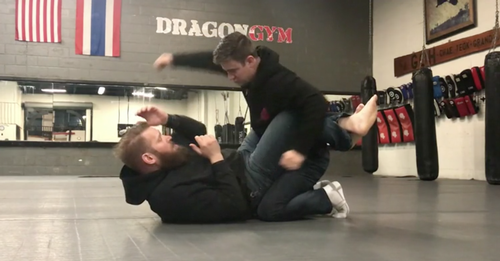 When you join Dragon Gym’s Martial Arts classes, you become part of something much greater than just a workout program: you become part of an incredibly supportive and encouraging community. We've helped hundreds of people of all sizes get in the best shapes of their lives while learning the art of Taekwondo. Our system is progressive and will work for anyone who commits to it. You will never be expected to do more than what you are currently capable of, and you will never feel embarrassed or left behind. I see your program is a combination of Taekwondo, Hapkido, and some other systems. What does this mean? The Adult Martial Arts program taught exclusively at Dragon Gym HQ combines some of the best aspects of traditional Taekwondo and Hapkido. In addition to these arts, Master Sikdar has incorporated essential basics from western boxing, Muay Thai, and Brazilian Jiu Jitsu. Finally, students learn to strength train using both barbells and kettlebells. The goal is to develop a well-rounded martial artist: one who can kick, box, grapple, and defend themselves all while getting in great shape, having fun learning new skills, and challenging the mind and body.